The subtlety of Robert Breer’s whimsical Osaka I, which is currently on view in the Museum of Modern Art’s Sculpture Garden, stands in contrast to most kinetic art. Powered by car batteries—a nice nod to the artist’s father who was an engineer for Chrysler—the sculpture moves at a rate of 2 ½ feet per minute. Slow enough to go unnoticed. That is until you walk away and return to find it several feet from where you swear it was just standing. Having noticed that, you stop to look at the sculpture—one of what the artist called “floats” or “motorized mollusks.” Staring at it, your eyes start to blur and your head gets a little funny because it’s subtle enough to make you question your vision and memory. It’s like trying to see the moon move. A woman sitting in a nearby chair starts to get uncomfortable when she realizes she is sitting way too close to the art. “Wait,” she thinks, “is this art? And did I approach it or did it approach me?” To be safe, she moves to another seat. 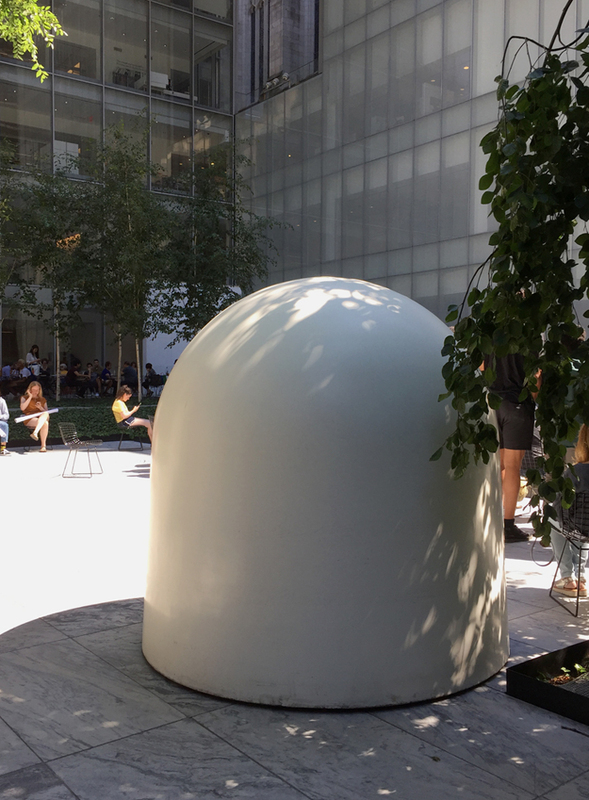 Several eons later, the giant white gumdrop nudges the woman’s former chair and politely reverses course—looking for other visitors to unseat or unsettle, silently menacing the garden. Robert Breer's "floats" amid Nakaya Fujiko's fog sculpture, Pepsi Pavilion, Expo '70, Osaka, Japan. 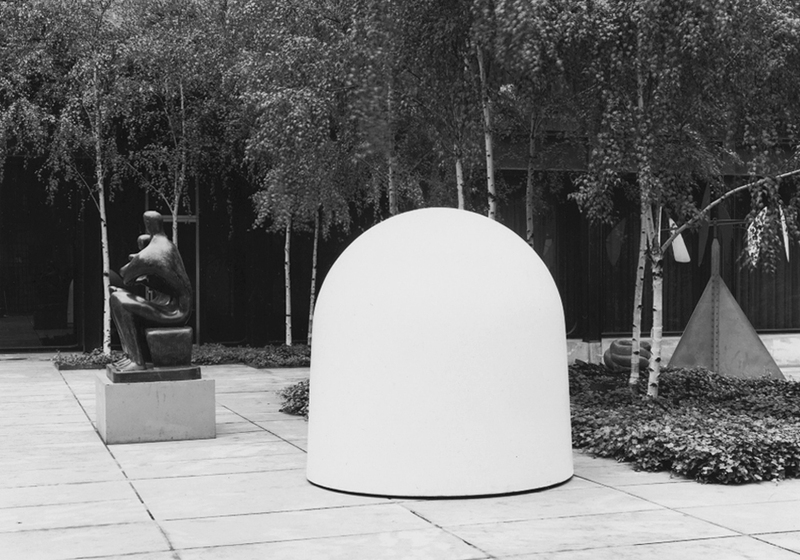 Robert Breer's Osaka I installed in MoMA's Sculpture Garden in 1970. Photo from MoMA's online archives. Morsels are a series of brief texts—ruminations—on a single work of art. Like the insects drawn to the marzipan fruits and veggies in Marcel Duchamp’s late work Sculpture-morte, we too are endlessly attracted to such saccharine artifice, the all-too-real. But are the flies in this trompe-l'œil attracted to the image of the fruit (as a viewer is to a painting) or the sweet aroma of the marzipan? And are the flies plastic or rubber—the kind used in a practical joke—or made of marzipan as well? It seems unlikely—or worse, unsettling—that both predator and prey would be made from the same sugary substance. What form of cannibalism would that be, in which the mirage consumes itself? 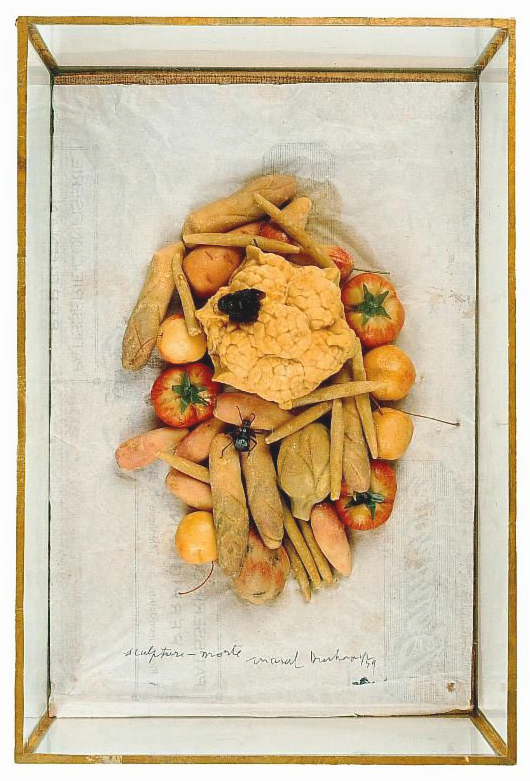 Both images: Marcel Duchamp, Sculpture-morte, 1959, insects with marzipan fruit, vegetables, and bread on board-mounted paper, in glass box, 13 1/4 x 9 x 2 1/4 inches; Collection Centre Pompidou, Paris. Morsels are a series of brief texts—ruminations—on a single work of art. This one is un morceau pour Marcel.